RTÉ Sport today announced the shortlist of seven finalists for both the RTÉ Sports Person of the Year Award and the RTÉ Team of the Year Award. Drawn up from over 5,000 nominations submitted by the public to www.rte.ie, which were then whittled down to the present short-list by the judging panel, the winners will be presented with their awards at a gala event that will be televised live on RTÉ One at 9.35pm this Friday 21 December. The event will also be shown live on www.rte.ie (RoI only). On the night, a panel of well-known Irish sports stars and analysts will reflect on the shortlists, debating the Irish sporting year that was. RTÉ rugby analyst and former top player Brent Pope, World Indoor Athletics champion Derval O’Rourke, All-Ireland winning Clare hurling captain Anthony Daly, former Irish soccer International Liam Brady, 2006 Ryder Cup Vice Captain Des Smyth and All-Ireland winning Cork footballer Tony Davis will all offer their views on the highs and lows of Irish sport in 2007. The seven previous winners of the award are Sonia O'Sullivan (2000), Mick McCarthy (2001), Pádraig Harrington (2002), Barry Geraghty (2003), Ronan O'Gara (2004), Seán Óg Ó hAilpín (2005) and Henry Shefflin (2006). 7) The Kerry senior footballers, who became the first football team to win back to back All-Irelands since 1990. The winner of this year’s RTÉ Sports Person of the Year and RTÉ Team of the Year will be decided by an expert RTÉ judging panel consisting of senior RTÉ Sport personnel from across all arms of the organisation - television, radio, news and online. 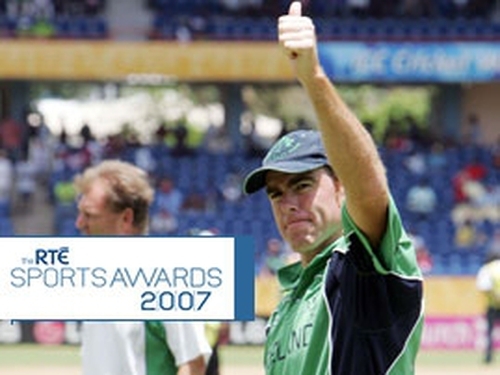 The RTÉ Sports Awards 2007 in association with The Irish Sports Council will be presented by RTÉ’s Michael Lyster, Darragh Maloney and Joanne Cantwell. The gala awards ceremony will also see the honour of the RTÉ/Irish Sports Council’s Hall of Fame Award presented to a very deserving Irish sporting veteran.